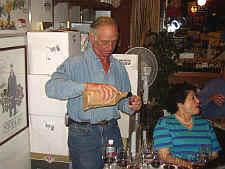 Tasting coordinator Greg Bellow arranged for the tasting participants to provide a range of (mostly) Syrah wines from (mostly) the 1996 vintage. The 1996 is rather highly regarded in the Barossa Valley and McLaren Vale areas, sources of most of the wines for this tasting. The growing season got off to a somewhat early start, so there was the risk of frost damage. The frost did affect many regions, but the Barossa Valley and northern areas of South Australia were not impacted. The McLaren Vale also missed the frosts and many vintners view this vintage as particularly good. We had one entry from California, a Qup Syrah, as some sort of mystery wine. Five wines received at least one first place vote, while 6 of the eight received at least one last! 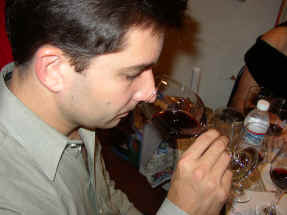 Many tasters reacted negatively to what one described as the "green, vegetal notes countered by strawberry jam tones. It's not flawed, really, just shallow and simple." Another questioned if this wasn't the "ringer." One person found "Brettanomyces and barnyards aromas with burnt sugar and wet hay." Another found a "green, herbal, sour aftertaste." I found herbal, smoky, woodsy notes with a vegetal, leafy quality. 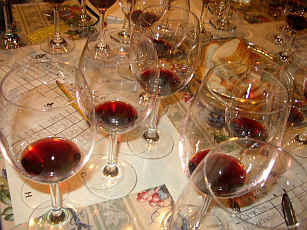 The wine is simply at odds--unripe on one level and chocolaty and over-ripe on another. 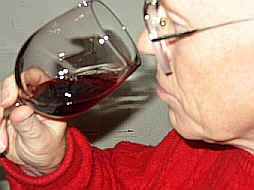 The wine is soft and dry on the palate. Ho hum at this stage. No Australian in character, but only vaguely Rhne-styled. "Dusty, blueberry, cotton candy notes with fine-grained tannins, but there's no 'there' there." said one critic. Others found the candied elements and blueberry fruit. One taster felt this also had a "strange aftertaste." Another detected "cooked fruit," to which someone else noted was reminiscent of "rhubarb." I keyed more on the candied elements here, with some sweet cassis notes and raspberry-like fruit. It's still somewhat tannic and a bit coarse, with some woodsy and berry flavors on the palate. I gave it a one star rating on my three star scale, no stars being a standard or ordinary wine. One fan described this as showing "blackberry and licorice, with mocha and cedar notes and a long finish with an earthy tone." Someone else encountered a :touch of Brettanomyces." 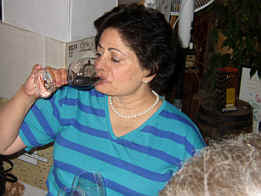 A third found "petrol on the nose with plenty of dark fruit, a tea note and a long finish. It 'stings' of alcohol, though, as it's very ripe." One person felt this "was a little bit over-done, with a sour aftertaste. It may have been impressive when it was younger, but it seems to me to be unbalanced at this stage." My descriptors for this featured smoky and charry notes with a burnt hickory undertone. The wine is mildly tannic, a bit dusty on the palate, alcoholic and pretty much a standard red wine of no particular charm. Amusingly, the bottle had its "Wine Advocate" rating affixed to it and this wine was pegged as a "95 point" wine by Robert Parker a few years ago, who noted it may be cellared for a decade or more. One taster described this wine as "smoky and meaty with more Northern Rhne Syrah elements than any other wine in the tasting. It's medium-bodied and higher in acidity than most to go with its long finish." But one critic panned this for having "nail polish remover fragrances as it's quite volatile." Another detractor found "oxidized notes with an opulent plum fruit and pruney overtones with low acid but high in tannins and it finishes on a bitter note." I found mildly herbal fragrances with a dusty note on the nose and some berry fruit. It's lightly tannic and mildly astringent. I didn't find this to have much "Shiraz" character, but it's a pleasant enough red. I recall we featured this wine in its youth and it was a nice wine one could put on the table in place of a Cabernet or Merlot. One star. "This is a big boy!" said one taster, "it's huge, thick, with smoked meat notes and currant notes. Rich, ripe, with oaky, blackberry elements, but somehow this is missing something...there's a hole here." Someone else said "It seemed to really develop in the glass" and this sentiment was echoed by a number of people. One person found notes "reminiscent of cherry cola with a mint finish, but it was very under-whelming." Another taster found lots of "dark cherries" in this big red. For me, the aromas are "classically" Australian Shiraz! Lots of sweet violet fragrances are intermingled with red and black berry notes and sweet flowers. It's got lots of fruit with a hint of a Cabernet tone (10% Cab as it turns out). Very deep, rich and complex. Two stars+. "This wine shows lots of spicy oak and little else!" said one critic. Another taster found "No nose here!" Others found some distinctive notes, one person likening this to "Heitz Martha's Vineyard as it has a eucalyptus character with mint." 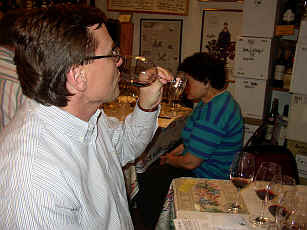 Another taster found "Mint, licorice, shoe polish and a mouthwash 'feel' to this wine." Someone else said "This is a great red wine for Bourbon drinkers and it's got so much strong oak, much like Bourbon!" For me, this was another wine I could easily identify as being Australian Shiraz. This is a big fruit bomb, with lots of oak, some violet-like fragrances and a bit of pepper spice. It's full, rich, ripely berryish on the palate and having a nice balance of fruit and oak. I gave it a two star rating. "Well-balanced." were the words of one critic. "Fat, lush, oaky, minty and having a peppery finish, this is a brilliant wine!" said another taster. "It's rich on the palate with heavy oak and black and red currant fruit, but I rated it down for its excessive oak." said another person. Someone else felt it was "a little bit over-ripe," while another found it "a bit alcoholic." One taster said it's "over-ripe and jammy." 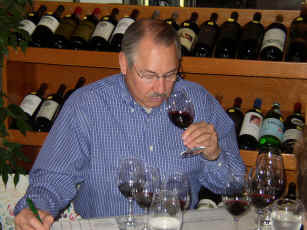 I found lots of berryish fruit aromas and plenty of red fruit all the way through. There's a plum element here, too. It's big, brawny and has nice length on the palate with good fruit flavors enhanced by nice oak. One star+. We have not seen this wine here in the U.S. and the bottle was supplied by a tasting participant who acquired it privately. One person described this as being "Merlot-like as it features some green pepper and herbaceous notes." Someone else said it's "Brilliant, flashy with a muted nose at first, but then dark plums, cherries, black currants and oaky notes blossom in the glass." Another critic found it to be "tarry, minty and zesty with green peppercorn notes and a sweet point on the back palate." One taster detected "eucalyptus and peppery notes. It's unfocused and very ripe with a long finish." Someone else found "Cloves, pepper and cassis," while another person found notes of "licorice." I found some lovely floral fragrances with ripe berry fruit, violets and a touch of spice. The same features shine brightly on the palate, so the wine is big, berryish and spicy...quite typical of Aussie Shiraz. Two stars.